Flaounes are Greek Cypriot Easter bread filled with cheese, raisins and topped with sesame seeds. Flaounes (“φλαούνες”), pronounced “fla-ou-nes”, have been made in Cyprus for many years and serve as a celebratory food for the breaking of the fast after lent. They are made in 3 separate stages, first the dough, then the filling, and finally the baking. This recipe is from Stefan's mother who lovingly prepared them every Easter for the family growing up. 1. Sift the flour into a large bowl and stir in the yeast, salt and sugar. 2. Add the oil and enough water (a small amount of water) to make it firm. 3. Kneed the mixture for at least 5 minutes until it is smooth and has an elastic feel. 4. Put the dough aside for around an hour to rise. 1. Beat x4 eggs in a bowl, then set this aside. 2. In a separate bowl coarsely grate the halloumi and cheddar cheeses, add x1 tablespoon of flour and the baking powder. 3. Slowly stir in the eggs mixture until you have a puff-like paste: do not use all the eggs mixture if it starts to become runny. 4. Stir in the dried mint and the sultanas. 1. Preheat the oven at 200 degrees celsius (392 F). 3. Place the disc on to a plate of sesame seeds and place a generous tablespoon of cheese filling in the centre, spreading it slightly. 4. Pull the dough up at 4 points to make a square and pinch the sides together to seal them so that the filling is still visible and bursts out a little in the middle. 5. Lay each filled flaouna on to a greased baking tray. Continue until all the discs are filled. 6. In a separate bowl, whisk an egg, then using a pastry brush, brush the egg mixture over each. 7. Sprinkle sesame seeds over each flaouna. Traditionally the flaounes are prepared on the Greek Orthodox Good Friday for consumption on Easter Sunday. 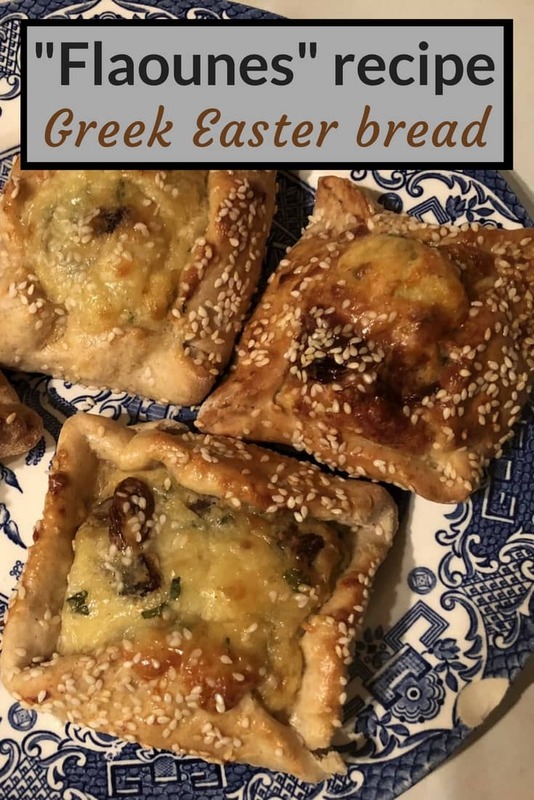 They go very well with Greek egg lemon chicken soup, which is also commonly eaten during the Greek Easter weekend.